This is not the case tho since they have a well established point of refrence in the game. This makes sure they keep the most amount of people happy. Ofcourse they will make mistakes, They are still human. If you do all the daily’s etc as a f2p you’ll easily be able to keep up. I can catch up if I spend 500 pound. The dailys don’t catch u up. If i cant get hero’s to red how can i compete against teams with honor when I can’t get essence to add honor to my red hero’s? I tell you how spend a lot of money. Dailys do not help me get 30 plus hero’s to red. I get your concerns but the devs do their very best to keep it fun and challenging for everyone. This does include the spenders, They keep this game alive. If you like them or not, it’s a necessary evil. But knowing this you can absolutely catch up if you put the time and effort in it. Money is just an easy skip the time button. This game is already like chess, my all time favorite game. Keep up the good work with such a superb game. I don’t see how any f2p can “keep up” in these days, when those who spend can’t even. Maybe your opinion to “keeping up” is different to mine. Mici you’ve just been brain washed. It is actually possible but it’ll take months to do. You’ll only increase by 2 or so levels each cap relative to the rest if your lucky. The red rarity grind at the moment is an improvement. The chapter costs are too expensive, I am aware these will lower with time, but prohibitively expensive at the moment. The drop rates of the new items are too low. So… I either have to spend a little money. Maybe I’ll get 2 pieces of gear. There’s the gear that needs 4 or more of the old stuffs. 80 shards each. Ugh. And then there’s the essences. Now. These can’t be written off as for spenders, like the crystals. How do I get the essence? By levelling a hero to red. Yeah I can’t do that again. Oh, the meta changed with honour skills? Those five or ten heroes I chose? Half of them are irrelevant now? State of the game 2018? Right now, I doubt I’ll make 2019.
pixi is correct…f2p will NEVER catch up with p2p…they should be seperated somehow…different server? now with another merger f2p will become extinct by 2019. sad cause there is not another game like this to turn to…obviously pb does not consider the f2p in the long scope of the game…they are silently booting us all out. such as it is the world revolves around $ even in a game. am hoping some game developer out there creates a very simular game without all the space sucking updates that are not needed and nothing to pay for. seems like per blue did not really think this game through before they let the public start playing. No f2p game would separate players like that. The point is that although some players can pay to be ahead, everyone can enjoy the game as a single big community. In a sense, other players (including f2p) are content. Plus, there’s always that chance that f2p players will buy some stuff at some point. I agree with you all. Grinding to get your hero’s to red cost a crazy amount of stamina. And to get the essence you need more red hero’s is how you get the essence you need for 1 hero. And building the gear the game freeze up, then you have to restart the game. Bug in system. And last contest I used 117,000 stamina made 3 red hero’s. So you are apparently completely unaware that the majority of free download games out there have a “micro transaction” pay to win style. Especially games like PQ and other strategy games. Even Candy Crush offers advantages to people for cold hard cash. It is harder to find Free download games without in game transactions than those with. It is how they support the continued development and support of the game. It is the current business model trend that most companies have latched onto. To single out PB shows an extreme ignorance of current app store economics. Do I think the current gap between ftp and p2w is really big? Yes i do. But it is small compared to other games i have played. And PB has made valid efforts to address player concerns. Have those efforts been to the satisfaction of all players? Of course not because that is not possible to satisfy everyone. This is a free download game. And all content has been eventually obtainable for those choosing to play completely free. Which is not something other games with the same business model always do. I am not sorry for this long diatribe. I am tired of all the complaining about a common business model. If you don’t like it, no one is forcing you to play. I have been talking to friends about separating spenders from non spenders not based on the availability of real life money. I am something like VIP10 having been sub for most of my playing time and buying deals worth up to maybe $100. The reason behind my actions is that I only buy to “support the company/devs” and not to be a top player. That aspect never interested me. In fact, I do like the grind that eventually lets you defeat the whales 25% of time through strategy and cunning. This o7-8 grind, dear god, is most horrible gaming experience in a good while. I had to go through my 20+ heroes I was making red (cost about 5k stam packs total, for those that wonder), write down on a piece of paper their items and then mark +1 for each item re-appearing so that I could farm several at once. Why is this not made into game somehow is beyond me. As for separating spenders and non spenders, there is one pretty good way imo. Currently I have 20k gems and about nothing useful to spend them on, except stam packs. Two additions to the game could change that, not including the removal of cap raise. Btw, they should understand that as long as there is no PERMANENT level cap, it’s pointless to make new servers, as people can never catch up. Max level at 150 and let it stay there for a year or two, find other ways for people to spend gems and stam. Alternate gears that can be mainly bought for gems. This is one outlet for spenders. 6 gear pieces that cost gems, but give bonus to stats. Nothing too op, but enough to make a difference. Say a fully gem-geared hero has 10% more attack/hp and 0.5 better cooldown/energy gain than fully regular-geared hero. Chance to upgrade said gear, eventually. That way spenders will always be better, but with proper use of strategy and skills can be defeated. You can even make new raid events that would last limited time, few days to a week and have a chance to drop shards, so f2p can eventually grind them. Stat impriving aestethic items. This could be a golden mine for spenders. Give them a chance to customize their heroes while adding new stats. Different outfits, weapons, accessories, all with stat change. -a chainsaw for arm and a shotgun in the other, cuz Hail to the king, baby! 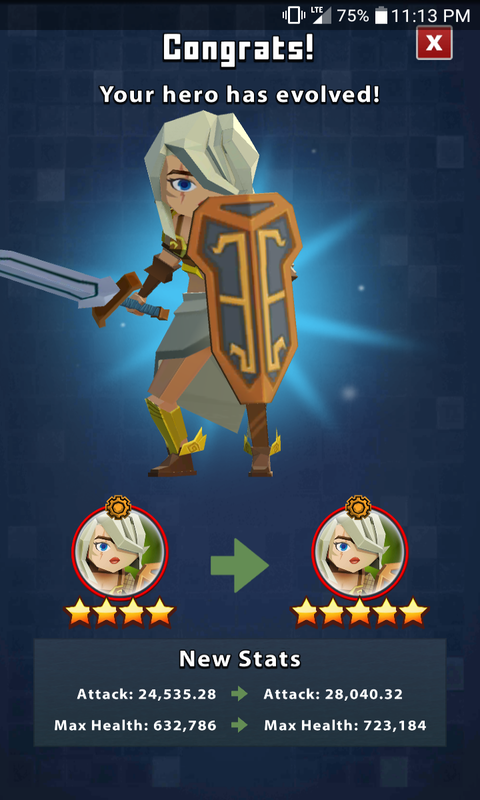 You can add in a ton of visuals with small boosts that will eventually make a hero very strong and everyone would look to buy those. Make them obtainable through some events (just playing them) and you will have alot of people buying tickets/keys to enter the raid place. Most importantly, you settle the game down, give ppl a goal, give spenders something to do, put a target on their backs for f2p to chase them. You do realize that real (skill based, zero p2w) games sometimes get very profitable by having cosmetic skins be purely cosmetic, right (no stat bonus)? Riot (now with Tencent) is way bigger than PB can ever hope to be. They should have charged up front except they’re a mobile app company trying to appeal to mobile users. Mobile users are more willing to try out a “free to download, free to struggle and get beaten up, pay to win” game and then spend thousands per month to keep up, than they are to pay even $5 one time for an even playing field. Mobile users get what they ask for. They’re voting with their wallets. What are you voting for? How many pay2download mobile apps have you purchased recently? Yeah, I’ve played games that have either or and enjoyed them when they are done well. I personally prefer cosmetics that have some stat boost (which i also think would work better for this game) but I have bought skins and farmed bosses for pure cosmetic reasons, like in Borderlands 2. Considering the smaller team here, I wouldn’t want to see effort go to waste, so preferably something that pretty much guarantees purchase without being op.